Over the years I have become reticent about recommending books as I have discovered that books often resonate with a person because of the time and place they are in individually. 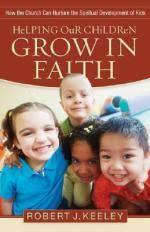 However, I will overcome my reluctance and challenge Christian parents, teachers and Children’s ministry workers to read “Helping Our Children Grow in Faith” by Robert J. Keeley (Baker Books 2008). Essentially Keeley unpacks 6 principles that he believes (and I concur) are important in nurturing faith in children. Children need to be nurtured in their faith by the whole community of faith, not just parents. Children need to be part of the whole life of the church. Children need to know that God is mysterious. Bible stories are the key to helping children know a God who is mysterious and who knows them for who they are. Faith and moral development are both important but they are not the same thing. Children should be part of congregational worship and they should have opportunities to experience developmentally appropriate worship. Not only are these 6 points beautifully unwrapped but a lot of the incidental teaching along the way is very valuable too. For example, when discussing the power of story, he touches on the danger of simply attaching morals to Bible stories. He suggests that if we simply connect a story to a moral (“Dare to be a Daniel or David” – my examples) we prevent children pondering what God may be teaching them. He also reflects on a passion of mine: children in worship. He says, “For children to have the kind of faith we want them to have, they need to be part of the worship experience.” Here I would like to have seen, at least, a mention of the impact that children have on the faith of adults as they can inspire us with their naïve simplicity. Overall, an excellent book that is worth reading, re-reading and discussing with family, colleagues and congregation so that we can all assist in the nurturing of that all import faith in the most vulnerable in our families, schools and churches. Thanks for the book review. My children are grown now, but it is wonderful to have good resources like this book provide.